The Obama administration and its critics have clashed over whether to try Khalid Sheik Muhammad and the other alleged September 11 conspirators in a military commission or in federal court. Both sides have been busily ignoring the obvious solution: don’t bother trying them at all. Muhammad has already spent more than seven years in military detention. Both the Obama administration and the Republicans who object to trying him in federal court accept the legitimacy of such detention as a traditional incident of war for those in the command structure of Al-Qaeda, and perhaps for associated forces as well. In general outline, so do the courts. Given these facts, the politically draining fight about civilian versus military trials is not worth the costs. It also distracts from more important questions in the legal war against terrorism. The question of trial forum is important in certain cases. 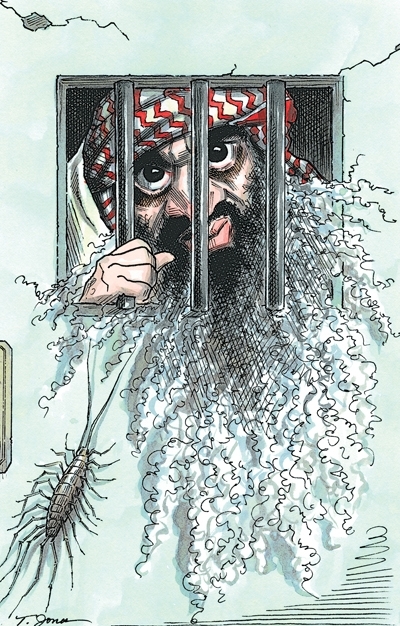 Before the Obama administration embraced the propriety of military detention, it was important for Muhammad, too. If one intends to hold people only pursuant to criminal charges, as some in the Obama administration once suggested, the nature of those charges and the forum for them matter a lot. But these issues matter much less after President Obama made clear—to the anger of the left and to assenting nods from just about everyone else—that he reserves the right to detain people outside the criminal justice system. The administration has said that it will continue to hold around fifty Guantánamo detainees without charges. That number is really a lowball fiction, because a large additional group of Yemenis is not going anywhere anytime soon. The administration also holds hundreds of alleged terrorists in military detention at the Bagram air base in Afghanistan and other overseas bases. It even reserves the right to hold in military detention terrorists who are acquitted at trial. Detention already incapacitates high-value suspects. The potential benefits of a trial would come at great cost. In light of the common ground about military detention between the administration and the Republican Party, what value might a criminal trial in a civilian or military forum add? Detention already serves to incapacitate high-value suspects. A trial potentially adds three things: the option of the death penalty; enhanced legitimacy in some quarters, especially abroad; and a certain catharsis and historical judgment in the form of a criminal verdict. These are not trivial benefits, but as the political battle over the past months has shown, they come at great cost. Domestically, the political costs of trying high-level terrorists in federal courts have become exorbitant for the administration—perhaps unaffordably high. The legal and political risks of using the ill-fated military commission system are also significant. Since the Supreme Court offered a road map for a legally defensible system, Congress has twice given its blessing. But serious legal issues remain unresolved, including the validity of the nontraditional criminal charges that will be central to the commissions’ success and the role of the Geneva Conventions. Sorting out these and dozens of other novel legal issues raised by commissions will take years and might render them ineffectual. Such foundational uncertainty makes commissions a less than ideal forum for trying Muhammad. Moreover, the public-relations and related legitimacy benefits of trying Muhammad by military commission are not that great, especially because the administration insists that he will remain in detention even if acquitted. The possibility that the administration might try him in a commission has been met with anger and disdain by the American left and many European elites, who think commissions are as illegitimate as they believe the underlying detention system to be. They will work hard to delegitimize those proceedings, too. In short, a military commission trial might achieve slight public-relations and legitimacy benefits over continued military detention of Muhammad, and it might facilitate his martyrdom by ultimately allowing the government to put him to death. But this would add so little to the military detention that the administration already regards as legitimate that a trial isn’t worth the effort, cost, and political fight it would take. Nearly nine years after the September 11 attacks, it is time to be realistic about terrorist detention. The number of Guantánamo trials will not, under the best of circumstances, be large. Instead of expending great energy on a battle over the proper forum for an unnecessary trial of Muhammad and his associates, both sides would do well to define the contours of the detention system that will, for some time to come, continue to do the heavy lifting in incapacitating terrorists. This essay appeared in the Washington Post on March 19, 2010.